I’ve been wanting to see if I could put together a good recipe for fruit bars that uses fresh fruit rather than dried. I’ve also sort of been in the mood to do something with whole wheat flour, so these bars are a reflection of that mood. My aim was to develop a nice little rustic pastry where both the dough and the filling are moist and delicious. I think these bars do the trick. The cookie dough bakes into a very tender, crumbly melt-in-your-mouth pastry. The filling has just a hint of sweetness to allow the fullest flavor of fresh fruit to blossom. If you don’t care for figs, substitute your favorite fruit or fruit jam. I’m sort of wondering about blueberries or plums or apples myself. And if whole wheat flour isn’t your thing, just use 1 3/4 C all-purpose flour instead. Add spice and/or finely chopped nuts to the filling for extra joy. - The pastry dough can be made ahead and stored in the refrigerator overnight. The filling can be made a few days ahead. In fact, I prefer to let the filling set up in the refrigerator so it’s a bit easier to work with. - If you’re going to substitute the fruit, the main thing is to cook it down until the fruit is jammy and most of the liquid is just about evaporated. Add sugar to taste, depending on the ripeness of the fruit. - Keep the dough lightly dusted with flour to prevent sticking and tearing. Have a kitchen towel handy to wipe your rolling pin clean every few rolls. Flour your hands, dust the rolling pin with flour and keep rolling. If the pastry warms up, put it back in the refrigerator for a few minutes to firm up. If you’re not used to working with pastry dough, divide it into three equal pieces rather than two and roll out smaller rectangles so they are easier to work with. - I use King Arthur Premium 100% Whole Wheat Flour (also known as King Arthur Traditional Whole Wheat Flour) for its superb flavor, consistent high quality and easy availability at many markets. It’s milled from the hard red spring wheat of the northern Great Plains and uses 100% of the wheat berry, which provides the full flavor and nutrients of the bran and germ. I think it’s the best of its kind out there and I highly recommend it. - If you favor whole wheat pastries, you might also enjoy Whole Wheat Honey Cake. To prepare the pastry dough, place the flours, cinnamon, sugars and salt in a food processor and process to combine. Cut the cold butter into small cubes and add to the dry ingredients. Pulse the mixture until the butter is in very small pieces about the size of grains of rice. Combine the milk and vanilla and add. Process until the mixture begins to gather in large clumps around the center of the food processor blade. Pour the dough onto a piece of plastic wrap, gather it into a cohesive package and shape it into a flat rectangle. Divide the dough into two equal pieces. Wrap each tightly in plastic wrap and refrigerate until thoroughly chilled or overnight. 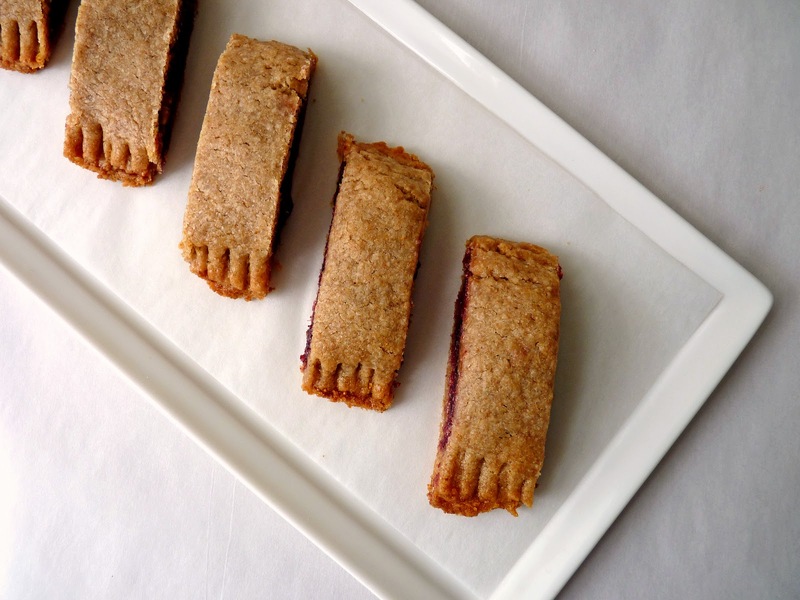 For the Fig Raspberry Filling, cut the stems off the figs and chop coarsely into small chunks. Place them in a saucepan with the water, honey or sugar and orange zest. Cook on medium heat until the mixture comes to a full simmer. Lower the heat and cook the fruit slowly and gently for about 15 – 20 minutes or until the fruit is jammy, stirring every few minutes and adding a bit more water if necessary to prevent scorching. Add raspberries and continue cooking for another few minutes until the raspberries have softened and broken down into the fig mixture. Take off the heat, add the lemon juice and cool completely. Store in the refrigerator to set up. When ready to assemble the bars, remove one of the Whole Wheat Pastry Dough packets from the refrigerator, place on a lightly floured piece of parchment and let it sit a few minutes to take off the chill. (The dough is ready to roll out when it doesn’t crack when you try to roll it out.) Dust the top of the dough lightly with all-purpose flour and roll out to a rectangle measuring 15” x 5”. Work quickly, running an offset spatula under the dough to make sure it isn’t sticking to the parchment and dusting lightly with flour whenever necessary. When you have the finished rectangle, lift the parchment paper with the pastry dough onto a baking sheet and refrigerate. Repeat with the next piece of dough. Once the pastry has been rolled out and slightly chilled, remove one rectangle at a time and continue to work on the parchment paper. Lift the rectangle up to be sure it isn't stuck to the parchment. 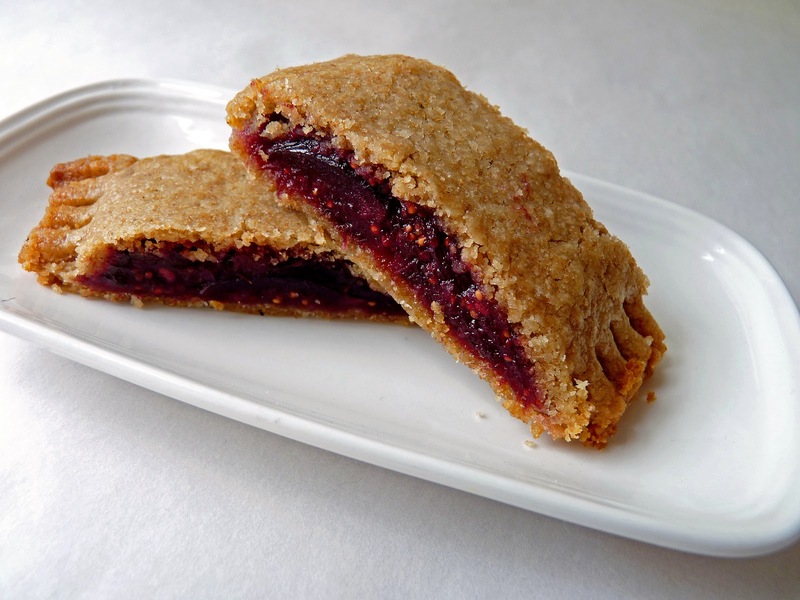 When the dough feels pliable, place half the fig raspberry jam on one half of the dough lengthwise, leaving a small border on all three sides. Gently lift the length of the parchment furthest away from you and bring it up and over toward you to fold the dough over the fruit. Gently guide and press the dough into a finished rectangle. If the dough is too cold and cracks slightly, just pinch it together as it warms up. Take a fork and press the edges together to seal. Lift the parchment onto the baking sheet and place in the refrigerator while you repeat this process with the second batch. Chill the formed pastry for about an hour. Preheat the oven to 350 degrees. Take a sharp knife and cut slices in the pastry about every inch or so but leave the pastry in tact and do not separate the slices. Place the baking sheet in the lower third of the oven and bake for about 25 minutes. Cool completely, then slice the bars again to separate. These are best eaten the same day. They soften over time. I like how rustic these cookies look, reminding me of my first ever whole wheat dainties about 35 years ago when we didn't even keep sugar in the house and we used oil instead of butter. I wish we ever saw fresh figs in our rural grocery store ... still, with 2010 a great year for black and raspberries, these cookies are a must try. What a great early fall recipe! I can taste them already. We're on vacation but I snagged a little computer time -- just had a feeling some new delicious thing was cooking here. 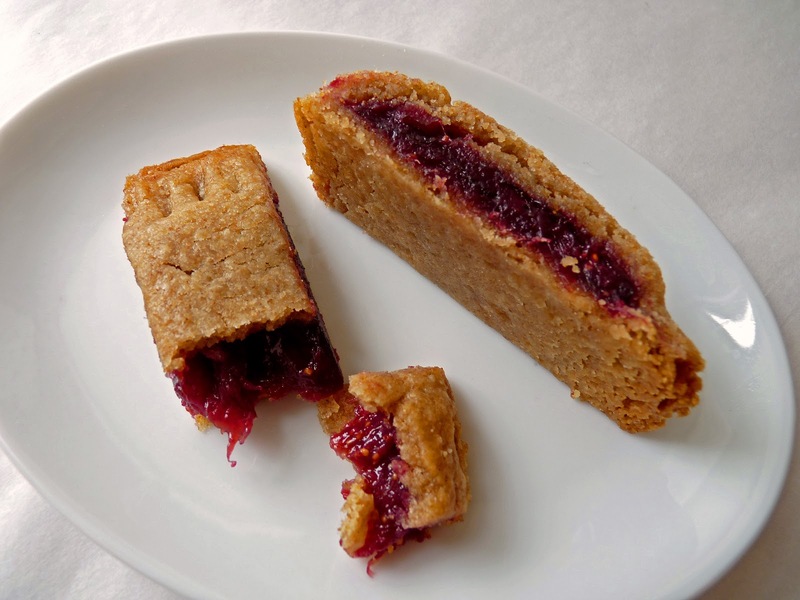 These fig raspberry bars sounds delightful, especially since figs and raspberries are two of my absolute favorite fruits! They make me think of fall, which is fast approaching, so I think I'll have to make them! These sort of remind me of sweet dough pies (childhood favorite) but with a more pie-like dough (adult preference). Will definitely add this lovely recipe to the list. Unfortunately it was extra wet this year, so the figs here in Louisiana are especially watery. One day I will get to CA and try your figs. They look so luscious, like an entirely different fruit. These look like a perfect addition to my table when I have the ladies over for a coffee/meeting later in September. Great timing and a super recipe! This is a very fantastic idea. Well done! If you wont mind I'd love to guide Foodista readers to your post. Just add the foodista widget to the end of this post so it will appear in the Foodista pages and it's all set, Thanks! 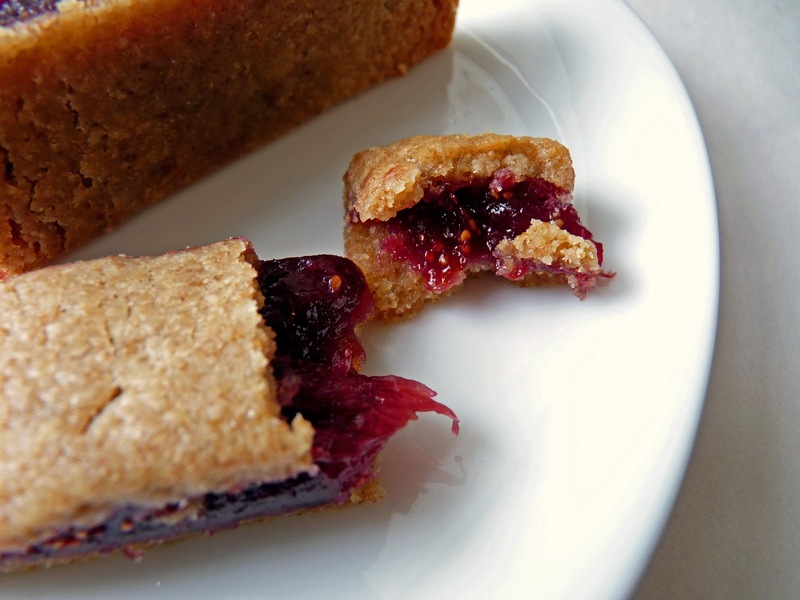 Fig bars. The breakfast of champions. The breakfast of me too! Yum! I'm way behind in reading my RSS feeds. I'm glad I spotted this recipe. I have ripe figs, always have raspberries (even if frozen) on hand and King Arthur products are jammed into my products. I'm going to try whole wheat pastry flour, though and see what happens. I was just staring at some ripe figs in my fridge, pondering what to make with them. Love this! I wonder if these can be reproduced somewhat closely in a shorter prep time recipe? made the jam first (tgi fig-season) with light calmyrna figs. so good. the brown sugar/whole-wheat dough was delicious. a little dry at first, i carefully folded it up and rolled it a couple times to combine it fully before working with it, with no resulting toughness at all. the finished product was too great. crunchy ends, tender middle. i was happy to see that the jam didnt over-soak the dough, it was just the right amount of moisture. next time i would definitely use black mission figs for a richer, wine-y-er fig flavor. Hello GooberNgrape! I'm so glad you enjoyed them and I thank you for your feedback. I know it can be tricky for most people to work with dough so I tried to make this as simple as possible to produce. I love this combination of whole wheat and figs. These look absolutely delicious! I have a giant green fig tree in my back yard and I am always trying to figure out different ways to use them all!